So The world cup is so close! As is Glastonbury!…and we’re in the middle of preparations! The point of this post is to plea! We’re looking for your ideas as we are going to make an enormous flag and we would love your imput – throw your ideas our way and your idea can be up in the sky during these two monumental occassions! So your ideas would be massively welcome, you can send them to us in numerous ways; you can email me: pete@johnnycasio.co.uk tweet us: twitter.com/johnnycasio or on facebook: www.facebook.com/johnny.casio and we look forward to hearing from you in a big way! Wouldn’t it be awesome to see your idea on infront of the pyramid stage? Or in Cape Town amongst the World Cup festivities?! Secondly, we’re getting excited at the potential opportunity of the first award for the Johnny Casio team. We have been nominated for a VISCOM BRIAN AWARD – part of the Birmingham Istitue of Art and Design end of year show. It would be great if we could win the highly credible award and the big night awards doo is next week (Tuesday) so we’ll let you know how we get on! 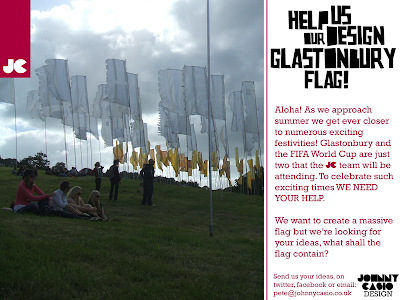 Thats all from me, Get in touch with your flag ideas and we can’t wait to receive them!